WASHINGTON — U.S. Immigration and Customs Enforcement and the Department of Justice returned a more than 500-year-old copy of Christopher Columbus’ letter describing his discoveries in the Americas to Spain during an evening repatriation ceremony at the Residence of the Spanish Ambassador to the United States on June 6, 2018. The letter, originally written in 1493, was stolen from the National Library of Catalonia in Barcelona and sold for approximately $1 million. In March 2013, it was discovered that the Columbus Letter believed to have been stolen from Barcelona was reportedly sold for 900,000 euros in June 2011. Following extensive negotiations with the U.S. Attorney’s Office for the District of Delaware, the individual in possession of the letter volunteered to transfer custody to HSI Special Agents, which was then brought to Wilmington, Delaware in February 2014 for further examination. In March 2014, a subject matter expert evaluated the letter and determined that the document was “beyond all doubt” the original stolen from the National Library of Catalonia. Let’s get this out of the way right from the start. At the heart of this piece is a massacre, a bloody mass murder executed in a scorching swamp as empires fought to assert their dominance in the New World. The initial body count was in the hundreds, inflicted over nationalistic fervor and minor religious differences. Even so, it is the background for one of my favorite forts, a small outpost in a coastal salt marsh that was set up to guard a Florida city’s back door. Today, 450 years later, the blood had dissipated. Visitors to Fort Matanzas take a pleasant boat ride from the parking lot to sun-drenched Rattlesnake Island and climb a set if wooden steps to the stone gun deck. Underneath the platform is a cistern to capture fresh rainwater (the surface water being too brackish to drink), and at one end stands a square tower that holds barracks, officer’s quarters and a powder magazine topped by a lookout deck (see laser scan video by AIST and the University of Southern Florida, above). The site’s history goes back to the 1500s when the Spanish were wrestling with the French to claim a section of the new continent’s southeast coast. Spain set up camp in what is now St. Augustine, Fla., and France had Fort Carolina up the coast to the north, near the mouth of the St. John’s River. So, on to the massacre. In September 1565, the French sailed to attack the Spaniards at Augustine, but a hurricane blew them too far south. They overshot their destination and wrecked somewhere around what would become Cape Canaveral. At the same time, a Spanish force headed north of Fort Carolina and, in the absence of a defending army, easily took the place. Meanwhile, the shipwrecked French started hoofing it back up the coast toward their base. They had three problems. First, their path would have to pass the Spanish at St. Augustine. Second, Spain had already raided Carolina, so there wasn’t much to return to. But they never got to the point of figuring out the first to problems because (problem No. 3) the Spanish came down to meet them at an inlet 14 miles before they got to Augustine. Outgunned, the French surrendered, but the Spanish also demanded they convert to Catholicism and massacred 111 Frenchmen who refused to give up their Huguenot faith. No one expects the Spanish Inquisition, especially not so far from Spain. The scene was repeated two weeks later when a group of French stragglers showed up at the same inlet, resulting in 134 dead. People started calling the inlet Matanzas, a Spanish variation of massacre, and the name stuck. A few years later, the Spanish built a wooden watchtower and thatched hut at the inlet, which provided an inland route for ships to approach Augustine. It was manned by six soldiers, whose main duty was to book it upstream and alert the Spanish base when they spotted enemies approaching. They thwarted attacks from pirates and were briefly captured by English outlaws. The Spanish began worrying less about the French and more about the British, who were setting up forts in Georgia and Charleston, S.C. Spain began building up Augustine, breaking ground on what would be Fort Castillo in 1672. The wooden Matanzas outpost was converted to stone in 1740 and helped drive off the Brits on at least one occasion. Not long after that, Spain traded Florida to the Brits in exchange for Cuba, which England had captured earlier. Then, Spain got Florida back in 1783 but turned it over to the United States in 1821. Included in the deal was Fort Matanzas, which by that time was a dilapidated property. The U.S. Department of War restored it, and it was later turned over to the National Park Service. 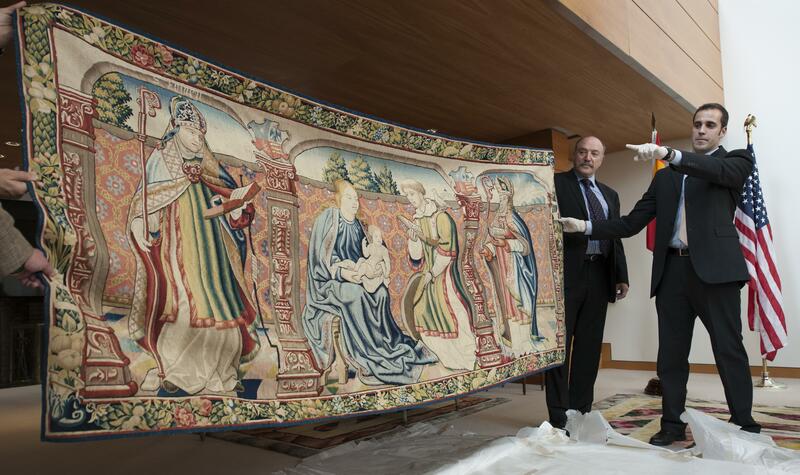 Immigration and Customs Enforcement personnel return a 16th century tapestry, stolen from a Spanish national cathedral in 1979, to the people of Spain. The tapestry was seized by U.S. Immigration and Customs Enforcement’s (ICE) Homeland Security Investigations (HSI) special agents in Houston, Texas. Photo courtesty of Immigration and Customs Enforcement. In December, we wrote about the recovery of a looted Spanish tapestry in Houston. On Wednesday, the piece was formally turned over to the Spanish government during a ceremony in Washington. The work depicts St. Vincent, who lived in the 3rd century and was martyred around a 304 because of his faith. Ravens guarded his body from vultures and then took watch over his grave, until 1173, when he was dug up and moved to Lisbon. He is the patron saint of wine makers and vinegar makers. WASHINGTON – U.S. Immigration and Customs Enforcement returned a 16th century tapestry, stolen in 1979 from a church, to the government of Spain Wednesday at a repatriation ceremony at the Spanish ambassador’s residence in Washington. The tapestry was seized by ICE’s Homeland Security Investigations special agents in Houston after it was sold at auction. The wool and silk tapestry was stolen in December 1979 from a national cathedral in Roda de Isábena, in the province of Huesca, Aragon, Spain. The tapestry depicts St. Ramon, the Virgin Mary with infant Jesus, Saint Vincent of Saragossa and Saint Valerius, used as an altar piece in the Romanesque cathedral. The tapestry was produced in the early 1500s and was part of the church’s collection when the cathedral was declared a national monument by royal decree in 1924. The return of this cultural property to Spain is the culmination of an investigation by HSI Houston, HSI Madrid, U.S. Attorney’s Office for the Southern District of Texas, Department of Justice’s Office of International Affairs, Belgian National Police, Spanish Civil Guard (Guardía Civil) and its Historical Heritage Protection Group. In November 2012, HSI special agents seized the tapestry, under the National Stolen Property Act, from a local Houston business under an HSI initiative called “Hidden Relic.” This initiative is designed to investigate, recover and repatriate stolen cultural property. 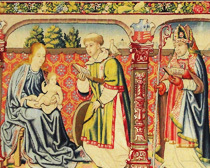 The government of Spain requested assistance under the Mutual Legal Assistance Treaty in recovering the stolen tapestry after a curator at the Museum in Lérida, Spain, notified the Spanish Heritage Protection Group that the tapestry was listed for sale in a January 2010 catalog from the Brussels Antiques and Fine Art Fair. The Spanish Civil Guard notified the Belgian Police that the tapestry was stolen. An investigation was initiated and it was discovered that the tapestry was purchased in 2008 by an auction house in Munich by a Belgium gallery owner along with two partners in Milan and Paris. The tapestry was circulated in galleries in Milan and Paris before arriving in Belgium. In April 2010, the tapestry was subsequently sold at auction for $369,000 to a business in Houston. Photo courtesy of Immigration and Customs Enforcement. HOUSTON – U.S. Immigration and Customs Enforcement’s Homeland Security Investigations special agents last month seized a 16th century tapestry stolen from Spain. The tapestry depicts the Virgin Mary and Saint Vincent of Saragossa. It was produced in the 16th century and was part of the cathedral’s collection that was declared a national monument by royal decree in 1924. It was stolen in December 1979 from the cathedral in Roda de Isabena, Spain. In January 2010, the tapestry was put up for sale at the Brussels Antiques and Fine Arts Fair in Brussels, Belgium. It sold at auction for $369,000 to a business in Houston, Texas. The Spanish Civil Guard’s Heritage Protection Group learned of the sale. After investigating, it obtained a court order, and under the Mutual Legal Assistance Treaty requested assistance in recovering the stolen property. The tapestry was seized in November from a local business under an HSI initiative called “Hidden Relic” designed to investigate, recover and repatriate stolen cultural property. St. Vincent lived in the 3rd century and was martyred around a 304 because of his faith. Ravens guarded his body from vultures and then took watch over his grave, until 1173, when he was dug up and moved to Lisbon. He is the patron saint of wine makers and vinegar makers.